Did Rick Rubin turn Johnny Cash into a cheesy Goth? Can pop music be both great art and shameless kitsch? These days, it’s hard to find anyone who isn’t a Johnny Cash fan. Three years after his death, he’s become one of those rare musicians held in near-universal esteem. Everyone knows he’s great, and his music is touched with such timeless and ineffable cool that hipsters still love him despite his embrace by the unhip. Cash’s posthumous career, needless to say, is going very well. A best-of CD landed in the Billboard Top 10 last year, and a new album, American V: A Hundred Highways, arrived on July 4 and promptly hit No. 1. It’s the first Cash album to top the pop charts since Johnny Cash at Folsom Prison (1968)—proof positive that as much as we esteem our “living legends,” we prefer them recently dead and deified in Hollywood biopics. The current wave of Cash-mania kicked into high gear with last year’s Walk the Line, but the real force behind the Cash revival is Rick Rubin, the rock/hip-hop super-producer who oversaw the singer’s last five studio albums. Together, they’re dubbed the American Recordings series, and A Hundred Highways is the fifth volume. Rubin remembers a time when Cash had considerably less cachet. The producer saw his first Cash concert in the early 1990s—at an Orange County dinner theater. Cash had been dropped by Columbia Records, had made a string of lackluster albums for Mercury, and was contemplating an end to his recording career altogether. He’d been largely abandoned by country fans—his relationship with the Nashville establishment was always chilly—and the rock audience that had discovered him through Bob Dylan in the late ‘60s had likewise moved on. Rubin’s solution was simple; in fact, his solution was simplicity. On American Recordings (1994), Rubin stripped back the musical arrangements to a bare minimum, setting Cash’s fathoms-deep baritone against stark acoustic guitar picking. Throw in a couple of surprising rock cover tunes, a video starring Kate Moss, and appearances at the Viper Room in L.A., and the rest was history—up shot the record sales and in rolled the Grammys. The American Recording series also features some mesmerizing Cash originals, songs that present an old man’s awe-struck and amused meditations on death. American IV: The Man Comes Around (2002) is a virtual concept album about death, and its churning title track, with a lyric cribbed from the Book of Revelation, stands as one of Cash’s greatest creations. The mood is even more elegiac on A Hundred Highways, which was made in 2002 and 2003, in the months following the death of Cash’s wife June and before his own death on Sept. 12, 2003. In a ragged, wheezy voice—Cash suffered from asthma in the last months of his life—Cash sings gospel prayers, visions of resurrection, and another stunning new song, “Like the 309,” the last he ever wrote, in which he imagines his casket being loaded on a train for a final ride. And yet, for all their greatness, the Cash-Rubin records give off an unmistakable whiff of cheese. It feels peevish to find fault in albums that contain indelible performances by one of the 20th century’s singular troubadours. But if it’s possible for music to be both great art and shameless kitsch, look no further. In other words, Cash was an icon of authenticity, whose mixture of bad-boy attitude and down-home piety excited a rocker dude’s romantic imagination. Rubin’s vision of Cash as Ye Olde Goth is evident in the choice of repertoire—he steered the singer toward dark, death-haunted folk songs like “Mary of the Wild Moor” and covers of Danzig and Nine Inch Nails—and in the relentlessly monochrome musical settings. Rubin has always favored minimalism. (Even his hip-hop records are stark.) But the fastidiously unadorned and solemn music on the American Recordings series—bare-bones rock ensembles playing stately tempos, with bass piano notes tolling like church bells over minor chords —seems designed to clobber listeners with the idea that they are in the presence of a Great Man Singing the Truth. We usually associate kitsch in music with the big and blowzy, but the Cash-Rubin records use the opposite musical tactic for emotional manipulative effect. It’s schlock austerity. The most celebrated product of the Cash-Rubin partnership was the cover of Nine Inch Nail’s “Hurt,” and the resulting Mark Romanek-directed video was nominated for Video of the Year in 2003. But that video is the prime example of the occasionally dodgy taste that surrounded the rebirth of Cash. Trent Reznor’s song was an ambiguous ballad about masochism; Cash reportedly interpreted it as a drug-addict’s confession. But the Romanek video turns the song into ghoulish hagiography, interspersing file footage from Cash’s younger years with lingering shots of the present-day singer, looking very old and unwell—an unseemly mix of reverence (Johnny is God) and exploitation (Johnny’s Gonna Die Soon). The problem with all this Cash-worship is that it’s reductive. Cash had a long and varied career as an entertainer. Sure, he specialized in gothic country songs and murder ballads, and yes, he had a drug problem, wrecked some hotel rooms, and did other “rebellious” things. But he also recorded albums of children’s music and clowned around with the Monkees on The Johnny Cash Show, a tacky ABC variety program he hosted for two years. Rubin clearly cherishes the image of Cash as an anti-establishment renegade. 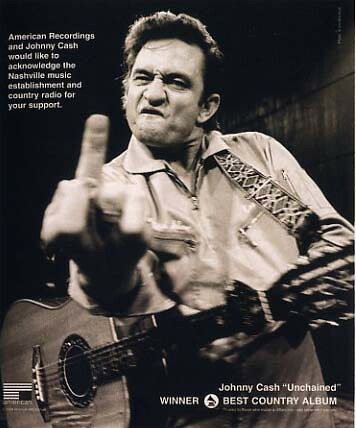 When Cash won the best country album Grammy for Unchained, Rubin took out an ad in Billboard featuring a famous photo of Cash flipping the bird to the camera above the inscription “American Recordings and Johnny Cash would like to acknowledge the Nashville music establishment and country radio for your support.” But the truth is, Cash was as steeped in show business as any Nashville hack—his “Man in Black” wardrobe was a uniform just like Tim McGraw’s 10 gallon Stetson, and the grizzled, wounded voice you hear on the American Recordings albums was just one of many registers in which he could sing. One of the more revealing recordings of the Cash-Rubin collaboration is the gospel-tinged “If I Give My Soul,” on Unearthed. According to Rubin, Cash began singing the song in a broad, stagy style. (He had just come off a concert tour.) Rubin interrupted Cash; he wanted a more intimate performance. The Unearthed version begins at this point: The singer intones “Get off-stage, Cash” and drops into his quiet, reflective, “soul-baring” mode. That moment reminds you what Johnny Cash was, on his first Sun Records recordings in 1955, during the final Rubin sessions just weeks prior to his death, and all those decades in between: a pro.